Checklists help admins and agents stay in compliance by tracking tasks, due dates, and required documents within a transaction. 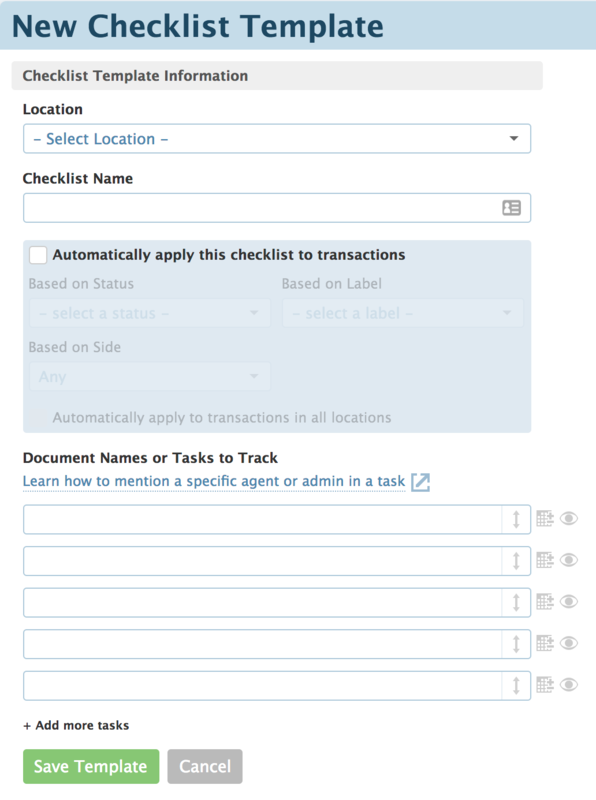 This article explains how to create and manage checklists to track transaction progress. Select [Checklists] from the left menu. Select a location, give the checklist a title, then add tasks. You can include as many individual tasks as you'd like on a template and add more tasks by choosing "+ Add more tasks". Instead of manually specifying absolute due dates, you can define relative due dates based on a transaction’s acceptance, close, and creation date. Click the calendar icon to add a relative due date. Select a trigger date and time frame relative to that date then click [Set Date Rule]. Click [Save Template].These date rules will be applied every time the checklist is added to a transaction in the future. Once you've added a template to a transaction, any edits made on that specific checklist are not applied back to the template. Click the gear and choose "Edit Template". Reorder tasks: To reorder tasks, hover to the right of the task until a hand appears. Click, drag, and drop the task to the appropriate place on the list. 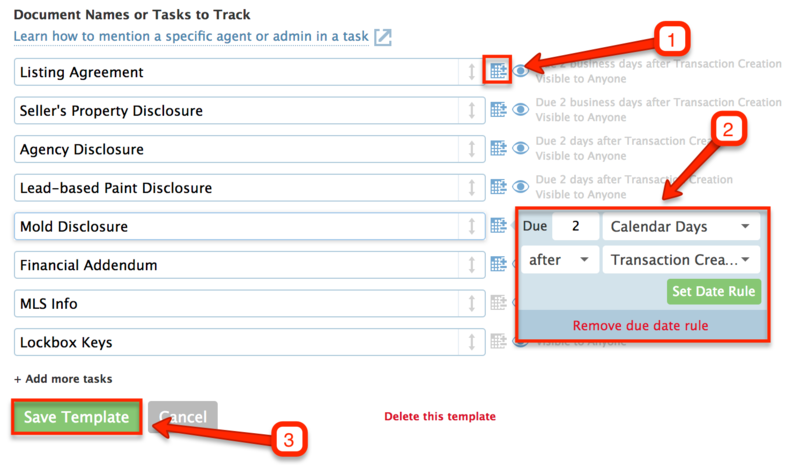 Change due date: Change a task's due date by clicking the calendar icon. Remove due date: Remove a due date by clicking the calendar icon and selecting [Remove Date Rule]. Clicking the gear and choose "Delete". Deleted checklist templates will not be removed from transactions. Checklist auto-assignment saves time for your admins and makes your transaction management workflow more reliable. Back up your checklist templates or share them with external managers and admins. Click the [Gear] and select "Copy Template". From here, you can update or change any info as you would when creating a checklist template.